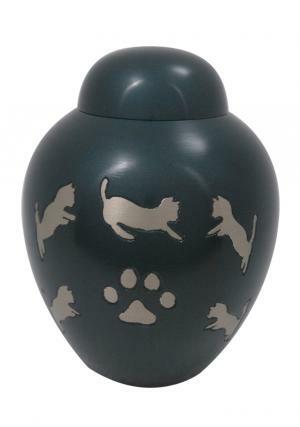 Dark Slate Dome Top Playful Cat Cremation urn with beautiful playing cat and paw print in dark slate finish. The playful cat is engraved with silver engraved with paw print on solid brass metal urn. 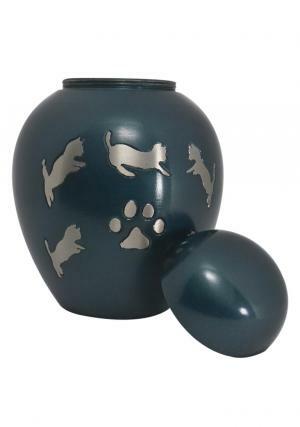 The Smaller Dark Slate pet cremation urn has a mounted dome top lid with secured screw threading and enameled in plain black. The ashes of the large adult cat pet can be preserved. Dark Slate Playful Pet Cat Cremation Urn measures to be 5.3 inch tall with 4.23 inch width and weighs 0.65 kg. 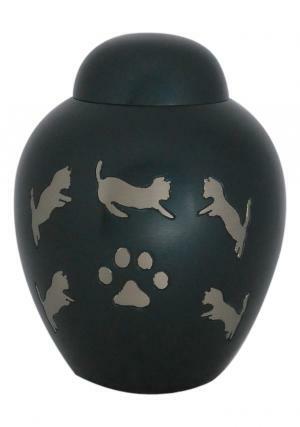 The pet cat memorial urn carries ashes up to large cat urn.